We provide replacement spindles for Excel 783506. All of our products are made with the highest quality materials and craftsmanship. We provide high quality drop-in replacement spindles for Excel 783506 and all Excel lawn mower spindles. For ordering information please fill out a contact form, email or call 502-689-9455. 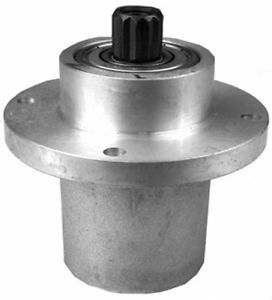 Spindle assembly replaces Excel / Hustler 783506. Fits Fast Trak, Mini Z and Super Mini Z models. Replacing your Excel 783506 spindle is a relatively easy process. While we always suggest relying on your local Excel dealer for service of your Excel spindles, here is a brief outline as to the steps necessary to replace your spindles. Needless to say, you will want to make sure that your mower is turned off with all safety switches engaged before you begin. You should also consult your owner’s manual before attempting any repairs or replacement of parts. Excel 783506 Spindle replacement: (1) Remove the deck from the mower. This will make it much easier to remove the spindle. (2) Remove the blade and the pulley from the worn spindle. You will likely want to repair all of your mower’s spindles even though only one is showing symptoms. By replacing all of the spindles at one time, you avoid repeated down time as spindles separately wear-out over time. (3) Remove the worn spindle from the deck. Exercise care and attention when removing the bolts. Use penetrating oil and let it soak. If the bolts break off you should drill and tap new mounting holes slightly offset from the original holes. (4) Replace the old spindle with your new ProGear replacement for Excel 783506. With any luck, your new spindle should last three to five years. Hustler Turf Equipment was born of a simple need – a mower that would maneuver the irregular landscape of the family home – complete with bird baths, gardens, and winding front walkways. The first Hustler was a compilation of mower parts and farm machinery, created by a genius named John Regier. Mr. Regier’s mower cut grass and steered like no other. It could hug a flag pole or reverse directions at a fence line, with a turn radius of zero degrees. With this, the world’s first zero-turn mower was born. And it changed everything.